The world’s most comfortable and efficient heating. In-floor heating is the world’s most comfortable and efficient heating.
. At The Boiler Guys, we provide all solutions to help get the job done. 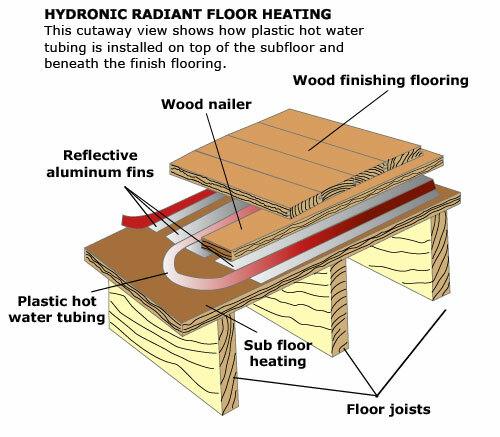 When considering an infloor system, you can choose from the following options. These are the three main option however there are variations of each option that can be discussed for your particular application. We are experts and there is nothing we haven’t seen. Heating pipes stapled to the subfloor and covered in a light weight concrete that provides greater efficiency through thermal mass and comfort to your home. This application is usually chosen during the renovation phase to allow for proper engineering of the home structure. Tubing stapled to the underside of the subfloor between the joists. We then add a R12 insulation between the joists with a 2-4 inch air gap between the underside of the subfloor and the insulation. This allows the heating to equally heat the space. The heat then rises to the floor evenly. Although not as efficient as a staple down system, it is very effective and widely used. during new construction or as a retrofit system. As homeowners have become increasingly aware of the importance of energy-efficient building practices and products, especially upon feeling the effects of rising energy costs, more and more energy-efficient products are being integrated into residential new construction and renovation. RAUPANEL system from REHAU allows you not only to run the most efficient system in you house but you’ll be doing that without adding major extra loads to your structure as RAUPANEL adds only 1.5 lb/ft2 (compare to 13-18 lb/ft2 for an overpour). Composed majority of aluminum panels RAUPANEL is also highly responsive and allows you to heat the room fast without the risk of overheating. RAUPANEL can be installed in any configuration in new or existing buildings without compromising the existing structure.